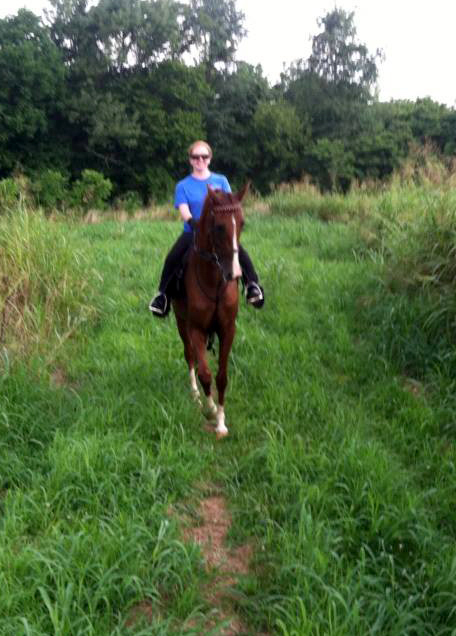 We thought it would be fun for Fiz to go out on a nice relaxing trail ride. We went out through a corn field on some cleared paths and he behaved very well. The scariest thing in the world to him is apparently a giant mound of gravel, with which Fiz was very unimpressed with. Barking/running dogs, rabbits, trees, tall grass: all fine! Mound of stationary gravel: It’s going to eat him alive. Cindy got to do the honors and ride him on his first trail ride-in an english saddle! Don’t laugh, it’s the only thing we had with stirrups short enough to fit her short legs! Don’t they look cute? ?